Wethersfield, Conn. (November 13, 2013) –When theologian Clement Moore penned the words, “Twas the night before Christmas…” in 1822, he could not have imagined the impact his poem would have on future generations. 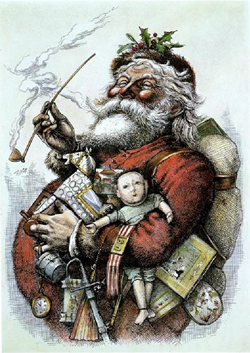 What Moore originally created to amuse his children is largely responsible for establishing the image of Santa Claus as he is known today: the well-rounded physique, merry nature, “eight tiny reindeer” and sliding down the chimney to fill children’s stockings with toys. Each year the Webb-Deane-Stevens Museum offers an enchanting and historic view of holidays past. The merriment commences in with the highly social Webb-Deane-Stevens Holiday-Preview Party on Friday, December 13, from 5 to 8 p.m. The sparkling event offers a special preview of the dazzling holiday decorations throughout the museum. Guests stroll from house to house enjoying delicious food, abundant holiday cheer and live holiday music ranging from the late 18th century to jazz standards, and chatting with friendly guides in period costume. Admission for the event is $25.Space is limited; reservations are strongly advised and can be made by calling 860-529-0612 ext. 12. At the Joseph Webb House visitors are dazzled by decorations typical of the early 20th century, a period of stunning decoration and celebration. The home is prepared for a Christmas open house that was typical of the times, including a sumptuous dessert buffet set up in the dining parlor. The culmination of several weeks’ work, the lavishness of the dessert and decorations could make or break the hostess’ reputation. Decorations include three Christmas trees, 200 feet of evergreen roping, fresh greens, fruit, and a collection of period ornaments. Also featured are a fine collection of antique iron toys from the late 19th and early 20th century and a charming Victorian doll house. Following the tours, visitors are invited to explore the Webb-Deane-Stevens Gift Shop, which offers a bounty of timeless treasures, from elegant household items to jewelry, books, stocking stuffers, hostess and children’s gifts and more. Hours – December – Open for tours daily 10 a.m.-4 p.m. with the exception of Tuesday; Sunday, 1-4 p.m. Note – The museum closes at 2 p.m. on New Year’s Eve. May 1 through October 31 – Open daily, 10 a.m. to 4 p.m., except Tuesday; Sunday, 1 to 4 p.m. April and November – weekends only – Saturday, 10 a.m. – 4 p.m., Sunday, 1 to 4 p.m. January 1 through March 31 – Not open for public tours, but group tours are available by appointment. In-depth theme tours and other educational programs scheduled during this period are posted on the web site. Offices remain open. For more information please visit our web site: http://www.webb-deane-stevens.org.